some of the finest fishing locations in Scotland for salmon, trout or pike fishing. All of our fishing trips include a professional guide, permits and all of the fishing tackle required. We can also assist in airport transfers and local hotel accommodation. There is no salmon fishing allowed on a Sunday in Scotland so if you wanted a weekend fishing break we can take you salmon fishing on the Saturday and either trout or pike fishing on the Sunday. Our pike and trout fishing trips are available 7 days a week. The Wild Brown Trout Season is from the 15th of March until the 6th of October but we can fish for rainbow trout or pike all year round subject to weather conditions during the winter months. Our salmon fishing trips and Speycasting lessons predominantly take place on quality beats of the River Tay in Perthshire although we also fish the River Spey in The Highlands and The North Esk and South Esk Rivers in Angus. All of the beats that we fish have the facilities you would expect on a quality salmon fishing venue including very well maintained grounds and a fishing hut with facilities for making hot drinks and heating meals. If you joined us for a few days we would try to take you to a different beat each day. Our trout fishing trips and fishing holidays can include both river fishing for wild brown trout or boat fishing on a loch for brown trout, rainbow trout and ferrox trout. We fish on the River Tay and several of the Tay tributaries for wild brown trout and we fish on several different lochs in Perthshire for rainbow trout and ferrox trout. If you joined us for a weekend fishing break or a fishing holiday for several days we can take you to different venues and give you a combination of river and boat fishing. Our pike fishing trips take place on several different lochs in Perthshire and the Trossachs National Park. All of the lochs that we fish hold double figure pike and are surrounded by some of the most spectacular scenery in Scotland. There is no closed season for pike and Sunday fishing is allowed so we can offer weekend fishing breaks or 3, 5 and 7 day fishing holidays. We would try to take you to a different loch each day but would always take you to the venues that are fishing best at the time. For visitors to Scotland we have a wide range of fishing opportunities to offer with over ten major salmon fishing rivers and over a hundred smaller rivers and tributaries, many with salmon and sea trout and most with a healthy population of wild brown trout. There are also grayling, pike and eels (in season) in a great number of our rivers. There are over 31,000 freshwater lochs in Scotland ranging from very small hill lochs holding wild brown trout and arctic char to some of the largest lochs such as Loch Awe which holds a number of species including salmon, trout, sea trout, ferrox trout, pike and other course species. Scotland also has over 7,000 miles of coastline providing excellent sea fishing opportunites either shore fishing or boat fishing. In the past decade their has been a significant rise in commercial rainbow trout fisheries in Scotland. The rainbow trout is not an indigenous species to Scotland but is bred to stock commercial fisheries because of their hard fighting qualities and rainbow trout fishing is now probably more popular than wild brown trout fishing as it is easily accessible and most fisheries have good facilities with refreshments and toilets. Scotland is world famous for Atlantic salmon fishing and attracts thousands of anglers from all over the world to fish in Scotland each year. The big four salmon rivers are the Tay, The Spey, The Dee and the Tweed although there are dozens of smaller rivers and tributaries of the main four which also provide excellent salmon fishing such as The Earn, The Teith, The Isla, The North Esk and the South Esk and many others throughout Scotland. Salmon fishing permit prices (excluding a personal guide) vary quite considerably depending on the river and the time of the year and can be from as little as £20.00 to £60.00 a day from the beginning of the season until the end of July. August is traditionally when the main salmon runs start on most rivers and continues until the end of the season. Permit prices at this time rise quite considerably especially on the main rivers. Permit prices during the latter months of the season can be anything from £100.00 a day to in excess of £600.00 per day depending on the quality of beat. You can still find relatively inexpensive salmon fishing on some of the smaller rivers or less productive beats of the major rivers for £30.00 to £60.00 per day. If you hire a professional guide he or she will be able to advise you on the best salmon fishing available at the time to suit your requirements and budget and should secure permits for you. If you want to fish without a guide then permits are available online either direct from the beat website or from an online booking agency. Alternatively most local tackle shops and some hotels issue permits. 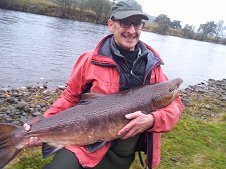 We provide fully guided salmon fishing trips and Speycasting lessons on the River Tay in Perthshire and the North Esk in Angus including highly experienced professional guides, salmon permits and tackle. Please email us for more details Enquiries. The two main types of trout fishing are wild brown trout, rainbow trout and sea trout fishing. 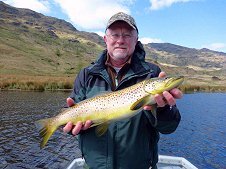 Brown trout fishing can be found on most rivers and wild lochs in Scotland and permit prices are relatively inexpensive from about £10.00 to £20.00 a day. Most river fishing is fly fishing only although there may be some smaller rivers which allow bait fishing. Loch fishing can be either boat or bank fishing and most of the large well known lochs have boat and tackle hire available. There are hundreds of small hill lochs throughout the highlands providing brown trout and Arctic char fishing although this might require a fair amount of walking depending on accessibility. Permits can be obtained from local outlets such as tackle shops, hotels and some post offices. The Brown Trout Season is from the 15th of March until the 6th of October on all rivers and lochs in Scotland. Rainbow trout can be found almost anywhere but the most remote regions in Scotland with well over 300 rainbow trout fisheries across the country. There is no closed season for rainbow trout as they are not an idigenous species to the UK and can be fished for all year round. A commercial fishery is a pond or loch which is regularly stocked with rainbow trout and depending on the size of the venue can be bank or boat fishing. Most venues are easily accessible and usually have car parking and facilities such as refreshments and toilets and some also provide tackle hire. In the main this is fly fishing although a few fisheries do have a separate spin and bait fishing area. Permits vary in price and will have a catch limit of 3 or 4 fish per session. Some fisheries will allow you to fish catch and release after you have caught your limit and most fisheries will offer a catch and release only permit at a cheaper cost. Permits are about £25/£30.00 for 5 hours or a day ticket but may be more if it includes boat hire. Almost every rainbow trout fishery now has a website with booking details, opening times and permit prices which can easily be found if you Google "rainbow trout fisheries in Scotland". Depending on the size and how busy the venue is you can take the chance and just turn up on the day a buy a permit on site. We provide guided trout fishing trips for both brown trout and rainbow trout including a professional guide, permits, boat hire and fishing tackle. 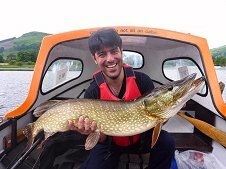 Scotland is regarded as one of best pike fishing countries in Europe which is hardly surprising considering the number of pristine lochs that contain double figure pike in big numbers. Although pike fishing is now becoming increasingly popular, salmon and trout fishing are the more traditional types of fishing in Scotland which has left the pike to grow into a very healthly and widely distributed population from the borders to the Highlands. Pike can be found in almost any clean freshwater loch from the smallest of ponds to the large lochs such as Loch Lomond and Loch Awe where double figure pike are caught on a regular basis. There is no closed season for pike as they are not regarded as gamefish although fishing for them in the early months of the year during the breeding season can be very poor. Fishing for pike is generally free although it is always advisable to seek permission before fishing. Where a permit is required it is usually relatively inexpensive at about £10.00 to £15.00 per day. Most of the medium to large lochs will have boat hire facilities and some may offer tackle hire. We provide guided pike fishing trips on several excellent pike fishing venues in Perthshire with professional guides who have a wealth of knowledge of the lochs we fish, boat hire, permits and all of the fishing tackle required. Scotland has over 7000 miles of coastline and there is no permit required to fish from the shore for saltwater species. There are a number of species that can be caught either spinning or bait fishing from the shore such as Cod, Sea Bass, Mackerel and flounders. There are a number of sea fishing charter boats fishing out of most main ports right round the Scottish coast offering inshore fishing for Porbeagle Shark, Coalfish, Greater Sandeel, deep sea fishing for Skate, Tope, Rays, Cod, Plaice, Sole and Turbot and wreck fishing for Pollack, Coalfish, Ling, Conger, Cod, Dogfish and Wrasse. Most good local tackle shops should be able to provide tackle hire and bait for shore fishing and advise you on sea fishing charter boats in the area. A number of charter boats have their own websites and most will have information locally in shops and hotels.